Just last month an international panel of sociology intellectuals, political theorists, and economists assembled on the campus of Bard College, on the Hudson River, just an hour's drive north of Manhattan. 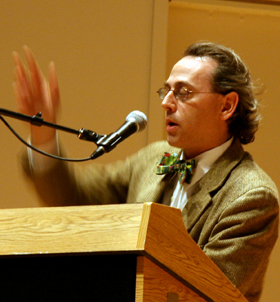 The group was put together by Roger Berkowitz and his supporters of the Hannah Arendt Center for Ethical and Political Thinking, to begin the discussion of The Burden of our Times: The Intellectual Origins of the Financial Crisis. "In an era of unroiled capitalism, self-worth and purpose are increasingly determined by workplace success. When higher cultures and spiritual values are being devalued, one way a person can secure meaning and sense in life, is through capitalism. Our Challenge, the burden of our times, is facing this reality. Our world has no value beyond profit and loss. In this sense the global financial crisis is more than a hiccup in the advancement of capitalism; it is a wakeup call to the consciousness of being. What does it tell us of ourselves?" Richard Bernstein of the New York Times conveys the first panel best. The title of one panel - "Can Arendt's Discussion of Imperialism Help Us to Understand the Current Financial Crisis?" - was typical of the conference, with its somewhat surprising assumption that Arendt, whose main concern was understanding the twin evils of Nazism and Communism, would have much relevance at all to a world dominated by what might be called Goldman Sachsism. But what that panel discovered in Arendt's writings on imperialism, which were part of her larger "Origins of Totalitarianism" work, actually echoes eerily and powerfully recent financial events. The crucial point is that for Arendt, the era of imperialism, which she believed began in the 1870s and lasted until the outbreak of World War I in 1914, marked the moment when the economic principle of unlimited growth and expansion came to dominate politics. It was the point at which private people pursuing great wealth, in essence, seized political power and made the protection of their interests the policies of the state - and it's not all that hard to see something like that happening today. The other panel questions included: Is the root of the financial crisis greed and the loss of values? Is global capitalism the root of the financial crisis? And furthermore, will capitalism be the solution to the global financial crisis? 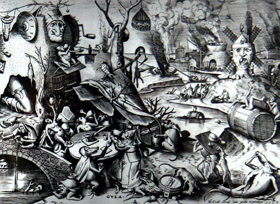 What are the political and cultural grounds of the financial crisis? The crisis is still fairly recent to be asking these questions, but "that is the point", remarked Dr. Berkowitz who has now put the conversation in motion. And he brought in an impressive international group of panelists. There were thirty participants, from as far away as South Africa. You can see the list of participants here: http://www.bard.edu/burdenofourtimes/ . You can see their accomplishments on Wikipedia. There were a lot of ‘isms' brought up in the dialog. After all this was an academic environment and the title did include the word "Intellectual". But one of the strong points of the conference was Dr. Berkowitz diversified picks of panelists with industry professionals, government officials, economists, intellectuals, and academia. Although much of the conversation referred to Imperialism, Neoliberalism, Marxism, Keynesianism, Stoicism, Chicago School, and Protestant Ethics, the panelists put their points right on the table for you. Jerry Kohn asked, "Are we already imperialist or are we part of a republic that can pause and augment the capitalistic and political structure?" Antonia Grunenberg urged, "government control needs to be revised, re-positioned on a global scale with political clout." Tracy Strong outlined, "four key steps to totalitarianism with the forth being erosion of the nation-state and that is of space that citizens belong.... In 2007, $3.2 Trillion dollars transferred per day with only $17.9 Trillion in world exports. This is contemporary Imperialism...Cross border ownership of assets: 12% of US equity, of 25% US corporate debt, of 44% US government debt, the spike in recent years lead to the global crisis. Our environmental damaging consumption is not sustainable. Dr. Strong's summary pulled from the Steinbeck book, The Grapes of Wrath, "Who can I shoot?" Roberta Sassatelli from the University of Milan, made an interesting point on the consumer and their change of values. According to Dr. Sassatelli, the consumer has not lost values but has seen a change of values. "The individual power of choice, the consumer lifestyle and greed gives freedom in the American lifestyle. Consumers, many armed with Internet information, have power, like voting power, and responsibility in their purchasing choices. They may choose products that are greener that leave less of a carbon footprint or buy domestically." 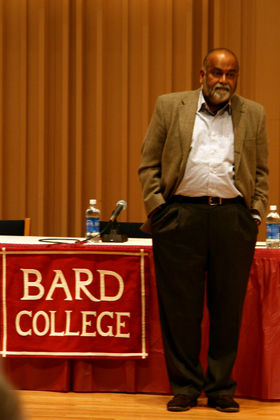 Keynote speaker, Arjun Appadurai, spoke at length on Max Weber and his book, The Protestant Work Ethic and the Spirit of Capitalism. In Dr. Appadurai opinion, without a rational banking system, one that utilizes double entry accounting and does away with derivative gambling chips, capitalism will fail. These are just some of the comments from day one. In day two, the day began with industry professionals who run an agency out of Washington DC that tracks the Shadow Banking System. A system, that transfers as much as a Trillion dollar a year, many times from drug and slave trafficking, and many times re-routing aid funding for third world countries back into bank accounts right here in the good old US of A. This is according to Raymond Baker, of Global Financial Integrity Org. Another fellow panelist, Jack Blum, of the Tax Justice Network, testified before the US Senator Committee on Homeland Security last week in favor of a new incorporation transparency bill. Liah Greenfeld, Boston U. Pollitical Science Professor, stated her prediction for the future of the United States. "The USA will become like Switzerland but without the banks, making chocolate and cuckoo clocks for the Chinese consumer." The keynote speaker for day two, Hunter Lewis, argued that our entire Keynesian based economy has never been mathematically proven. The idea that we can borrow our way out of the global financial crisis is betting our chips on hunches. The last panel included Tom Scanlon, an attorney for the US Treasury, who started his dialog with, "There is no shadow banking system." Obviously he missed Raymond Baker and Jack Blum's presentation earlier that day, or that was the US government's official position on the topic. Another panelist was Paul Levy of JLL Partners and one of the captains of the LBO business. Mr. Levy had a unique perspective of the financial crisis since he knows many of the Wall Street leaders on a personal level. He does not think of them as criminals and does not believe that most of them did anything outside of the law. When asked who do you blame. "I don't really know", replied Levy. But he believes many of them lack moral sense. Although many bankers are talented accountants and mathematicians, they are as shallow as a kiddy pool. "If you don't have values and would do anything for money, how can you find value in life?" Mr. Levy continued along this dialog, "A rich person is a person who is happy with what he has." If you are sorry that you missed the conference, and want more details, don't worry, the entire conference will be included in Roger Berkowitz's next book. Check back. Once it's available, I'll add the link to Amazon. The American working class lifestyle, that we have grown accustomed to, is unsustainable. If we don't begin to address this fact, it will address it for us. Our modern shortsighted form of government has fleeced us from the value of our citizenship. That which many of our parents, grandparents, and older generations have given their lives for, we have allowed our politicians and bankers to run down the value of our currency, drive down the quality of American life, and sack our children with debt of biblical proportion. There is no magical solution. It is not too complex or too big to understand. It is really simple. The future includes: less jobs, high taxes for those who have jobs, less social programs, less government infrastructure jobs, higher crime and violence, greater divide and tension between social classes, and high commodity prices. The top talent will hold jobs with global corporations, and hold the demands, travels and stresses of that position. The rest of us will become peasant farmers, without good healthcare. The failing economy will be followed by political unrest, then a risk of a revolution which will lead to outsourcing our federal government to the Chinese and Arabs. But this might not necessarily be a bad thing. Do you agree, disagree, or are you aloof to it all? Let's hear it below. Rob--I think your personal takeaway is typically smart. From an American point of view, yes, we will carry on but in a diminished capacity. Another conclusion one might draw is that the limits of capitalism's imaginary are even more important given the fact that economics has come to play such a central role in the world and in our personal sense of ourselves. Thus, the loss of US economic prestige is a big blow to our collective consciousness, one that may or may not be compatible with the self-image of the US that we and our politicians continue to hold and show little sign of being willing to give up. What we still have, however, is military might (or at least the illusion of such might) and that is a dangerous situation.